Can Gluten Cause Acne? How to Deal with It? Also referred to as the Melaleuca Oil or the Ti Tree Oil, tea tree oil is very useful and highly effective oil that has multiple uses and benefits. Tea tree oil has antiviral, antiseptic, antifungal and antibiotic properties. The leaves of the plant Melaleuca alternifolia is steam distilled to obtain the oil. Tea tree oil can be applied to face to treat pimples and spots caused by pimples. 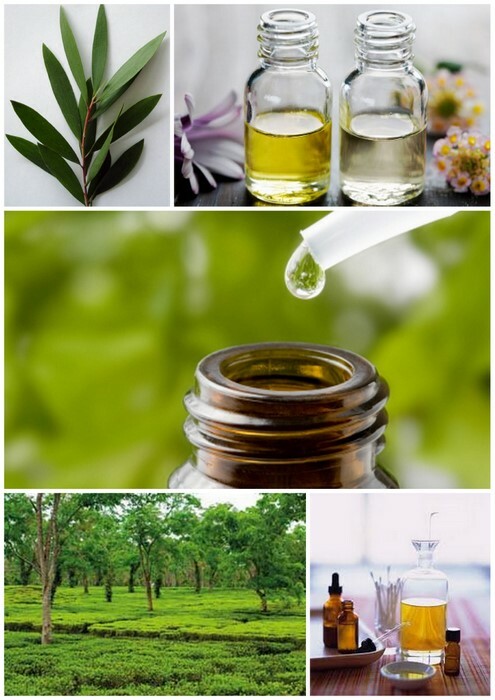 To cure acne effectively and naturally you can directly apply tea tree oil to your pimples on face. Its natural antibacterial properties make it an excellent alternative to synthetic chemical treatments that are harsh to your skin. A small amount of oil when applied to pimples penetrates the skin and removes excessive sebum, kills bacteria and dry out blackheads, and whiteheads. Take a cotton bud or pad or tissue and pour a couple of drops of tea tree oil on it. Dab the tea tree oil gently on the affected area. Leave overnight or for a couple of hours. Take care to always clean and dry your skin before applying tea tree oil. Also ensure to apply 100% pure tea tree oil and not products that contain some percentage of tea tree oil. You can also use tea tree oil in a spot treatment made at home. Take a few teaspoons of aloe vera gel and mix a couple of drops of tea tree oil into it. You can also use honey in place of aloe vera gel. Apply this mixture on to the pimple. For easy application, you can store these spot treatments in small lip-gloss containers. Take 2 tbsp. of green clay powder and mix in it 3-4 drops of tea tree oil. Add water to form a paste and apply it evenly over your face and neck area. Leave for 20 minutes. Rinse with lukewarm water and pat dry. Mix 1 tsp. of jojoba oil with 3 drops of tea tree oil and stir in finely chopped tomato in this blend. Mash the mixture to form a puree and apply the mask on face. Leave it for 10 minutes. Rinse with lukewarm water and pat dry. Take ¼ cup of plain yoghurt and add 5 drops of tea tree oil. Apply this mixture on face. Leave for 15-20 minutes. Rinse with lukewarm water and pat dry. You can make effective face scrub that fights acne using tea tree oil. Mix ½ cup of sugar, 1 tbsp. of honey, ¼ cup of sesame or olive oil and 10 drops of tea tree oil in a small bowl. Gently scrub your face with this mixture for approximately 3-6 minutes. This facial scrub is very effective for people suffering from mild to medium acne breakouts. You can also make this scrub in bulk and store in a bottle or jar. To help treat your stubborn acne, you can add a few drops of tea tree oil to the moisturizer and cleanser you use daily. However, take care that the mixture does not get into your eyes. To cure acne present on your back, chest and other parts of the body, add a couple of tea tree oil to your bath water. Tea tree oil can be mixed with shampoo to form an effective remedy against dandruff and lice. Mix 1 drop of tea tree oil to 30 ml of shampoo. You can also use tea tree oil directly on your scalp and then shampoo your hair. You can also add tea tree oil to your toothpaste to remove bad breath. You can also prepare your own mouthwash by mixing 2-3 drops of tea tree oil to 1 cup or 250 ml of water. Take care to not swallow the toothpaste or mouthwash mixed with tea tree oil. Add 3-4 drops of tea tree oil to 1 cup of water. Gargle with this mixture 2-3 times a day. Boil a large pot containing water. Add 2-3 drops of tea tree oil to this boiling water. Remove it from heat and inhale the steam for at least 5-10 minutes. Do this every night before going to sleep until your symptoms of chest congestion or sore throat are relieved. Apply 1-2 drops of tea tree oil directly to the affected toenail once a day. Add a few drops of tea tree oil to your bathing water to relax and soothe sore and tight muscles. Tea tree oil can be used effectively to prevent and curb the spread of skin infection. You can apply the tea tree oil directly to the affected area using cotton swab or gauze, one or more times daily. If you have bug bites and stings, you can apply tea tree oil directly to soothe the itching and irritation. You can also rub it on your legs, arms or any other exposed area to inhibit bugs from biting. However, tea tree oil should be used sparingly on face and contact with eyes should always be avoided. You can spray a solution of tea tree oil and water on molds and mildews in your bathroom. Tea tree oil acts as a disinfectant. It can also be used to clean the telephones and computer keyboards to inhibit the spread of viruses.